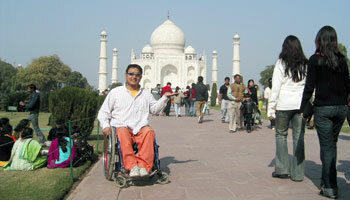 Over the years, disabled visitors who came to see the Taj Mahal could only gaze at it from the entrance. Now , they will be able to get a closer and more intimate view of the magnificent monument of love, thanks to the efforts of the authorities. The Archeological Survey of India (ASI) has responded to the needs of physically challenged tourists by constructing nine ramps at various points in Taj complex. This is the latest in the series of initiatives that have been taken for improving the quality of life of the disabled. The ramps apart , 12 wheelchairs are also made available to enable the physically challenged to move conveniently around the taj complex. Munazzar Ali , an ASI official at Taj ,said "Foreign tourist usually come with their own motorized wheelchairs and freely move around without assistance ,but domestic tourists use the wheelchairs provided by us. Nine ramps of different sizes and lengths have been constructed , the longest one being 48 feets" . Click here to get more info about Taj Mahal Facts . Return from Agra Blog Page to Taj Mahal IndiaTravel Homepage.